For lovers of sport, the word “Florence” is associated with the name of the glorious football club, Fiorentina. But it is most likely that absolutely not all “Fiorentina” fans know that the history of football in Florence dates back to many centuries ago. If you want to check it, you should visit the capital of Tuscany at the end of June. This is the time of the feast in honor of St John the Baptist, the patron saint of Florence. The unique sport contest known under the name of Calcio Storico Fiorentino is the main event of the celebrations. The costumed football match is held during three days, on the 19th, the 24th, and the 28th of June. Historical football in Florence is not just a thrilling sport competition, but also a creative performance. Historical football is played in the costumes and by the rules of the XVI century. The rules of historical football differ greatly from the modern ones. The most remarkable difference is the number of players. Teams of 27 people come to the football field by the Santa Croce Cathedral. The game lasts 50 minutes. Very different are the responsibilities of the captains. They must stop riots and pacify their players. But these are not the only peculiarities of the game. There are 33 points in the rules of Historical football in Florence. Historical Football in Florence revives the atmosphere of the XVI century; and this is not a mere chance. There was a game in the year of 1530 which had great political and historical importance for Florence. The troops of the Emperor, the most powerful at that times, had been laying siege to magnificent Florence for a year. The townspeople were in distress, though they managed to keep their spirits. To prove it, the Florentine men decided to arrange a football match, so that the enemy would see it. We don't know, which team won. 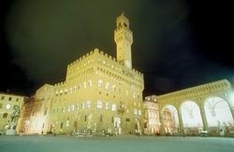 The history has kept just one fact, Florence got the victory once again . Historical football in Florence is a unique and bright holiday, which is noticeable even among the rich in cultural events life of the Tuscan capital. Florence invites you to the feast in honor of St John.